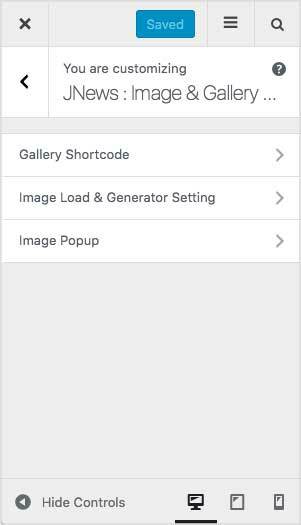 For more detail information about Gallery Shortcode setting, please visit our documentation about it on this page. Image is one of important thing for your website. With JNews, you will notice that image appears on several place such as on block post, hero, slider, carousel, etc. In this part, you can setup the general image setting for your website. Each of the option listed below has its own pros and cons that you need to know, so you can choose wisely based on your need. We provide 3 kinds of image loading mechanism. You can compare pros and cons on each option based on the following information below. Normal Load Image, this option will support retina, large size at first time load and good for SEO result. Lazy Load Image, this option will support retina, less number of image at first time load, better user experience and good for SEO result. Background Image, this option supports GIF image as featured thumbnail but bad for SEO result. We provide 2 kinds of image generator mechanism. You can compare pros and cons on each option based on the following information below. Normal Image Generator, this option has the fastest load time, but require more space. Each image that you upload will generate into 12 image dimension. If you switch this option, please regenerate image again. In this case you can use Regenerate Thumbnail plugin that fully supported by JNews. Dynamic Image Generator, this option has slower load time, but it will only happen when image is created for the first time. Image generated only when needed. In this part, you can setup image popup option for single post and page. This option will enable your image popup on Gallery Thumbnail, Single image, and WordPress default gallery. Zoomable, ability to go fullscreen, button for share on social network. Simple Option, option to turn all single image into one gallery. Turn on this option to set images on a single post as one instance of gallery. Please note, this option will appear and work if you choose Magnific Popup on Image Popup Script option.